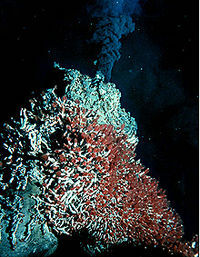 Hydrothermal vents habitat including giant tube worms. The habitat (Latin term that means, "it inhabits") is the set of conditions wherein an organism completes its life cycle. In relation to migratory animals, their winter area, their ​​summer area, and the routes by which they migrates all compose their habitat. Habitat is a concept used in ecology which includes the physical and abiotic factors that affect an ecosystem. ↑ Mauseth, James D (1998). Botany: An Introduction to Plant Biology (2nd ed.). Sudbury, MA: Jones and Bartlett Publishers. p. 738. ISBN 0-7637-0746-5. This page was last modified on 15 November 2013, at 15:40.